Participants were provided with copies of the narrative results and invited to complete an on-line survey to facilitate their feedback and provide assessment of testimonial validity, the degree to which the narrative was viewed as an accurate representation of their respective perspectives on sustainability (Stiles, 1993). 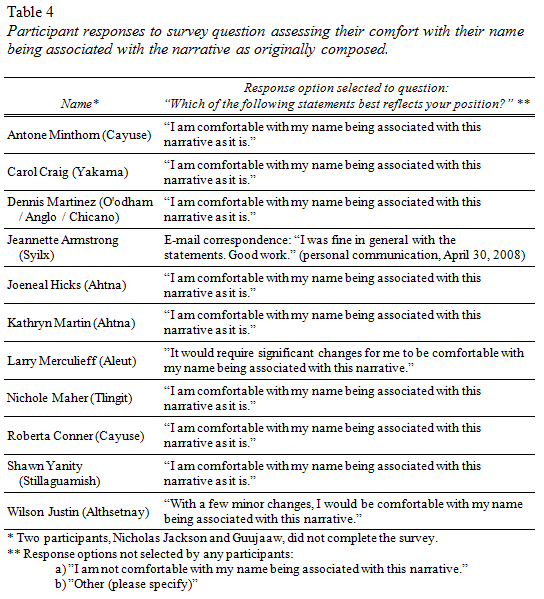 Ten of the thirteen participants responded to the survey (see Appendix I) for complete response data). An eleventh participants offered e-mail correspondence and indicated general satisfaction with the narrative. Feedback via the survey was largely positive, with minor issues identified by several participants and major issues identified by one participant (e.g., see Table 4). Questions about how well the narrative included a given participant's perspective and how well the overall narrative represented their perspective in general were scored from 0.0 to 5.0, with 0.0 corresponding to "strongly agree" and 5.0 corresponding to "strongly disagree." Mean scores ranged from 0.6 to 1.0, and standard deviations ranged from 0.52 to 1.12, indicating an overall solid level of agreement with the content of the narrative with some variability among the participants (see Table 5). Additional open-ended questions were posed to ensure accuracy in representation and to further gauge participant reaction. Appendix I provides full documentation of all responses to the testimonial validity survey. Greatest reservation about the narrative was expressed by Larry Merculieff (Aleut). A phone conversation and a series of e-mail exchanges were engaged to better understand the issues of concern for acknowledgement here. Appendix J offers correspondence shared by Merculieff regarding his primary concerns with the format of the narrative. Merculieff found the "we" narrative voice problematic due to its implication of grouping all participants in consensus around the statements. Concern was also expressed about taking information and quotes out of the full context that they were originally shared. This was cited as a recurrent problem in the attempts to "incorporate" traditional ways of knowing into Western science (L. Merculieff, personal communication, April 13, 2008). Merculieff also identified use of some problematic language. The handling of these issues and others raised are addressed below. In response to Merculieff's expressed preference to not have his name associated with the narrative content, all citations linking narrative statements to his interview content were removed. Two direct quotes of his were removed and replaced with paraphrased versions. Replacing with paraphrased content was essential to maintain the completeness of the narrative as reviewed and supported by the other participants. The two paraphrased sentences are: "In our worldview, everything is profoundly connected," and, "We must embody our awareness of the intimate and profound connection among all things. We possess an inherent intelligence, and if we operate with our minds and our hearts connected, then we will move in greater harmony with creation." All occurrences of the phrase "natural resources" were replaced due to expressed concerns that it was Western terminology and predisposes fish, wildlife and habitats to be viewed as commodities. Under the section, "A Human Focus," the occurrences of the phrases "people centered" and "human centered" were replaced with the phrase "a human focus." Concern was expressed that "human centered" implied that humans are more important than the Earth. Such an implication would be inconsistent with other themes of the narrative. The phrase "a human focus" was also deemed to be more consistent with the content of the original interviews. An additional modification to sentence order was made to give greater clarity to the intended meaning of the section that more focus needs to be given towards understanding our nature as human beings and towards structuring human systems to be in greater alignment with the natural world. The narrative's concluding statement initially read: "Gifted with this potential, our purpose is to continuously maintain ourselves and all our relations in harmony and balance with natural law. The extent to which our cultures serve this purpose is the extent to which they are ultimately valid and worthy of being passed along to future generations." The words "valid and" were removed due to concerns expressed about "valid" being a loaded term. Beyond loaded meaning, there was concern that with use of the word "valid," particular aspects of a culture that do not directly serve the stated purpose could be deemed as invalid. It was decided that the intended meaning of the statement was retained without the term. The first person plural ("we") voice was retained due to the support expressed by the vast majority of the participants, including direct statements of appreciation for use of the collective voice. The practicalities of restructuring were also a significant deterrent. I also personally believe that the accessibility, readability, and overall appeal of the content are enhanced by the narrative in its current form (see Appendix J for critique of this representation decision). Regarding the concern about quoting out of context, this is acknowledged as an inherent limitation of any exercise that necessitates reduction of information. As noted in the opening to the results section, readers are directed to the project website (see Appendix K) for complete interview transcripts. Beyond this, the testimonial validity survey was designed to reduce the problem by giving participants the opportunity to identify misrepresentations of any of their statements or perspectives. No specific statements were cited as being misrepresentative. The general concern led to the removal of two direct quotes as detailed above. A comment that the narrative lacks coverage of leadership as a key element in sustainability prompted consideration of the topic's inclusion. Leadership was raised as a topic under "Our Vision" and "How We Get There," but not directly under "'Sustainability:' The word and concept." Reviewing original content from the interviews, it was concluded that leadership was covered consistent with the manner in which it was spoken to by the participants as a whole預t least as interpreted by the researcher. Justin, who made the comment, did speak at greater length about leadership than many other participants. Indeed, his perspective was highly influential in prompting as much coverage of leadership as is found in the narrative. The reader is encouraged to see the full interview of Justin for more depth on the topic of leadership. "Recognizing God for giving us this gift," was shared as a comment related to the survey's question about level of agreement with the concluding statement of the narrative. The comment is acknowledged as legitimate, but it was not added as it would significantly alter the concluding statement as evaluated by other participants. Also, recognition of the Creator as the source of gifts appears several other times throughout the narrative. Despite the suggestion for removal, use of the term "sustainability" was retained throughout to fulfill a key aspect of the project's intention to explore the conceptual meaning of "sustainability." The testimonial validity process in general helped to verify and refine the accuracy of my representation of the perspectives shared. The updated narrative summary follows.